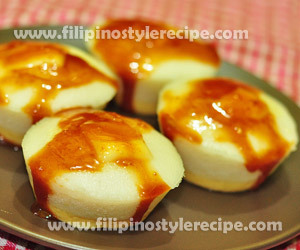 Filipino Style Recipe: Puto pao is another Filipino delicacy that usually served during meryenda(mid-afternoon snack). 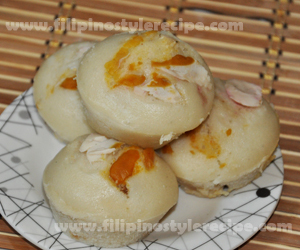 Puto Pao is similar to plain puto stuffed with filling same as siopao. 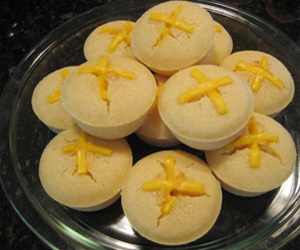 There are several versions of puto pao, in this recipe we will make asado for the filling. 1. In a bowl, mix together the flour, sugar, baking powder then pour water, powdered milk and stir well. 2. Add eggs and butter then mix until well blended. Set aside. 1. In a pan, heat oil and saute garlic then add ground meat and stir cook for 3 minutes. 2. Add the rest of the filling ingredients and cook until tender and the sauce thickened. 3. Discard anise and laurel. Set aside. 1. In a muffin cups, pour a little amount of batter then add a tablespoon of filling. 2. Cover the filling with another amount of batter until cup is half full. 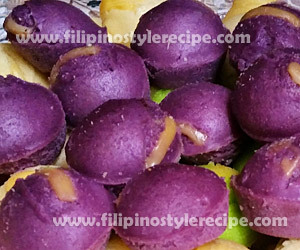 Filipino Style Recipe: puto bumbong is another Filipino delicacy that is usually served during Christmas season. 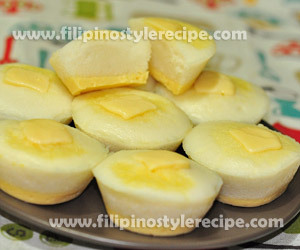 This dish is commonly sold along the streets during Simbang gabi. 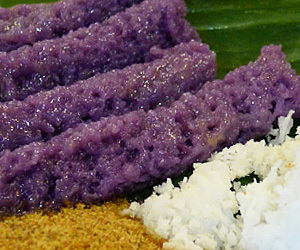 Puto bumbong is a purple colored glutinous rice cake steamed in a small bamboo tube then flavored with butter or margarine then served with freshly grated coconut and sugar(muscovado or panutsa). 1. Soak glutinous rice and purple-brown sticky rice in salted water overnight. 2. Drain and slowly grind using a grinder until grainy. 3. Wrap and squeeze the rice mixture in a cotton or muslin cloth. Then press it using heavy object to remove excess water. 4. In a large bowl, place the rice mixture and rub by hand until its texture becomes fine-grained. 1. Fill the bamboo tube with rice mixture and steam both side for 10 minutes or until color turns to dark purple. 2. Remove the bamboo tube from the steamer and shake out to remove the steamed rice mixture. 3. Transfer the steamed rice to banana leaves then spread with butter on top. Serve with freshly grated coconut and sugar. 1. 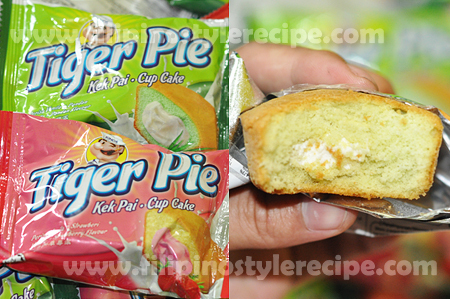 You may also used violet food coloring instead of pirurutong. 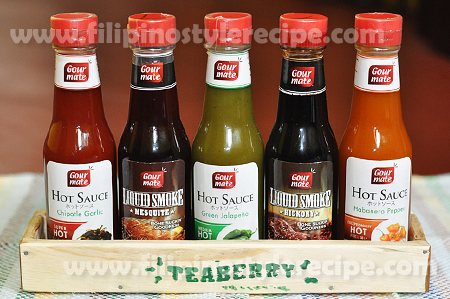 A Philippine favorite. Sprinkle with grated cheese on top, and enjoy hot or cold. This recipe involves baking the little cakes with the muffin tin standing in a tray of hot water – so not suitable to try with kids. 2. Mix together the flour, sugar and baking powder. 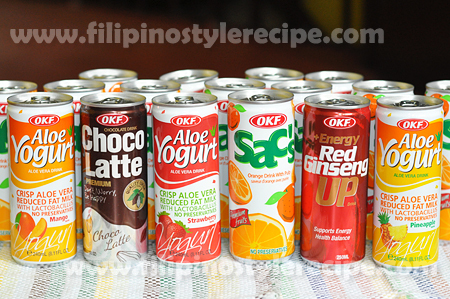 Pour in the water and evaporated milk and stir well. Mix in the eggs and butter or margarine. 3. Pour the mixture into muffin tins lined with baking cups. Find a baking tray that your muffin tins will comfortably fit in. Pull the oven rack out a little – approx 1/4 out of the oven – and place the baking tray (with the muffin tin inside it) on the rack. Very carefully pour about 1L of hot tap water into the baking tray. Then very slowly and carefully slide the rack completely into the oven. 4. Bake in preheated oven for about 15 minutes or until a toothpick inserted into the centre of a muffin comes out clean. Be very careful not to burn your hands with hot water or steam when you remove the muffins from the oven. Top with grated cheese.